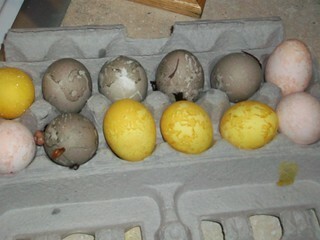 Results from our Easter egg dye experiment! Our “golden egg” – but where’s the goose that laid it?? You know sustainability is going mainstream when Fox News and Martha Stewart talk about natural egg dye methods. DIY egg dyes have been around for a long time, but are now popular enough to have their own kits sold online and in stores. And even though my great-grandmother may have dyed her eggs naturally, this is a new concept for me – I grew up thinking that placing magical fizzing spheres of color in plastic cups full of water was the only way to dye Easter eggs. All the eggs but one had a textured look instead of a smooth finish. 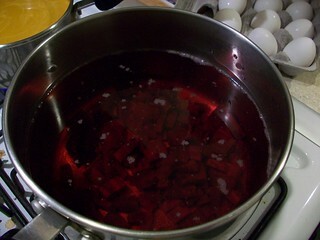 This is because we left the dyestuff in the pot, rather than straining it out before adding the eggs. 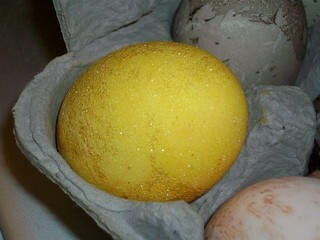 One egg, from the turmeric-golden batch, seemed to be covered in sparkling pixie dust! We think this may have been because the powder and “mordant” stuck to it in the pot. Mordant is a substance that helps the colors penetrate the eggshell, like white vinegar or cream of tartar (we used both). 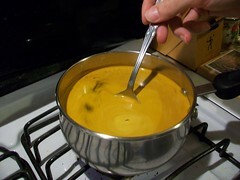 Our turmeric pot of magic. Try placing herbs like cilantro or parsley, or leaves with nice patterns, against the eggshell by wrapping them around the egg using a nylon stocking, then placing the egg in the dye bath. This should leave the pattern on the egg when finished. For a marbled look, add a drop of oil to the dye bath. We tried the rubber band method to achieve stripes, but the rubber band fell off the egg – this could work better in cold baths left to soak overnight. Much about dyeing Easter eggs the natural way is common sense – grape juice makes purple, spinach makes green, coffee and black tea make brown. But always check before you dye the eggs – results can be surprising! Of course, isn’t that part of the fun? Happy Easter, everyone! Our finished eggs, in three colors. Food Freedom: We Are What We…Label? Man, these were so much fun to make! And the one we thought would look the worst (not fully submerged, didn’t really keep clear track of how long it was in there) turned out being the most amazing – that golden sparkly one! I’m guessing it was the cream of tartar + turmeric + small side exposure to air that helped cement the effect. So neat!